My 6 yr old Gwyn LOVES to draw...she takes after her artist father. 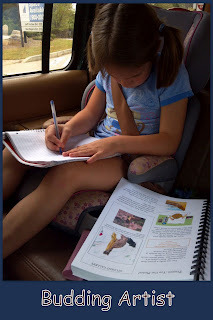 So when I discovered that there was homeschool art curriculum I was super excited and even more excited when we were provided with a review copy. I first discovered ARTistic Pursuits at a homeschool conference and immediately fell in love with the curriculum. We had to pick up our package at the post office and as soon as I opened it Gwyn begged to hold it. She immediately started paging through the ARTistic Pursuits book. Then she grabbed her notebook and started drawing right there in the car. Gwyn, myself and even her artist father love the ARTistic Pursuits art curriculum. These books are great for both the novice and experienced artist. I like that ARTistic Pursuits teaches children the technical side of art and also art history, art vocabulary and the materials that are used to create art. There is a book for every age and grade level from Preschool through Senior High. The ARTistic Pursuits books are non-consumable so one set can serve the entire family. In this review we will be sharing our thoughts primarily about the K-3 book. The K-3 book introduces children to the visual arts. The book starts out with two pages for parents. The first page provides the material list which is broken down into color coded groups. These are pretty simple materials and most can be purchased at your local Walmart or hobby store. Next is an explanation of how the book is broken down and how the curriculum is to be used. The book is broken into three main sections: What Artists Do, What Artists See and Where We Find Art. My husband was very happy that the curriculum contained the "What Artists See" section, as this is a very important aspect to teaching art, especially to young children. Then the fun begins!! First students will learn "What artist do." Children will understand what the visual arts are and what being an artist is. They will learn and understand more about composition, communication, landscapes, portraits, photography and more. Next they will learn about "What artists see? What do they see you may ask. Well they see lines, colors, shapes, forms, edges, etc. They learn that artists look at the world a little differently than others do. Then they learn "Where we find art." Many places and types of art will be discussed and lots of history will be covered. Everything from caves, palaces, pyramids, castles, churches, roadsides and more will be discussed. Different types of media (like clay, cotton cloth, tissue paper) will also be used in this final section. Before we started the first lesson I gave Gwyn a spiral bound sketch book I happened to have laying around. I let her make it special by decorating the front with pieces of scrapbook paper. And then we got started. Gwyn has completed about 4 lessons so far. Within each section the lessons are broken down into 5 parts. Part 1 is the introduction for the lesson. It discusses in a way that children can easily understand what elements of art or compositional arrangement will be covered in the lesson. These concepts are an important part of art and will also help build your child's visual arts vocabulary. Part 2 is an exercise where your child will observe and explore more about art using the environment around them. Discussion questions are included to make this process very easy parents. There is also a box next to each exercise which reiterates the lesson topic. Part 3 is the practical application of the lesson. In this section your children will look at piece of art and learn about the artwork, artist, culture, art mediums and time period. I have to say I REALLY enjoyed this part and so did Gwyn. There are several discussion questions which make the discussion process easy for parents. Gwyn and I have had a great time discussing the artwork and I am so amazed at her attention to detail. She was picking up on things in the artwork that I didn't even see. Part 4 is the project. Now comes REALLY the fun part!!! Your children will get to create their own masterpiece. This will help bring together what they learned throughout the lesson. There are examples of other children's artwork in the student gallery box. There is also a color coded box which indicates the materials that are needed to complete the project. Part 5 is the technical application. Children will learn about the different types of art materials and how to use them. So far Gwyn has been introduced to a pencils, erasers, ebony pencils and watercolors. Located in the back of the book there is even a certificate that you can provide to your budding artist after they complete all their lessons. 32 projects in each book include drawing, painting, printmaking, sculpture, and more! I love to draw and like learning about art. I really like my ARTtistic Pursuits book and like to learn about art everyday with mommy. 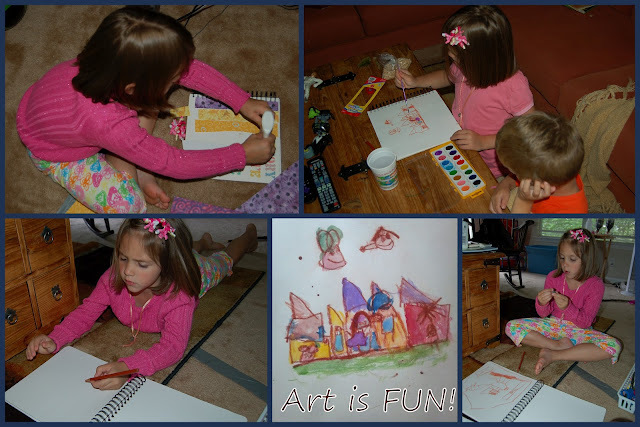 Gwyn also decided she wanted to share about ARTtistic Pursuits by doing a video review as well! And yes she is wearing her pajamas she lives in them when we are home. The books can be purchased directly from the ARTistic Pursuits website and cost $42.95. Not sure what art supplies you need to purchase ARTistic Pursuits has you covered there too with their Art Supply Packs. You can also find ARTistic Pursuits on Amazon in new or used conditions for a little less. *Disclaimer - I received a copy of ARTistic Pursuits in return for my honest review. Please note that prices indicated in the post are subject to change. I was not compensated for my review and all opinions are our own! Many of the links found on my side bars and in my blog posts are affiliate links. As a result, I might get paid money and I will most likely spend the money on homeschool supplies.